In the sun drenched Californian Valley of Ojai lies Ecotopia, a small community on 12 acres, along the banks of Matilija Creek. Ecotopia encourages people to be gardeners and stewards of the land, while self-guided tours of the garden and geodesic dome shelter provide inspiration, and a natural setting to breathe, relax and connect. The small garden provides fresh produce for their Community Supported Agriculture members, such as oranges, micro-greens, fresh teas and carob (a chocolate alternative). 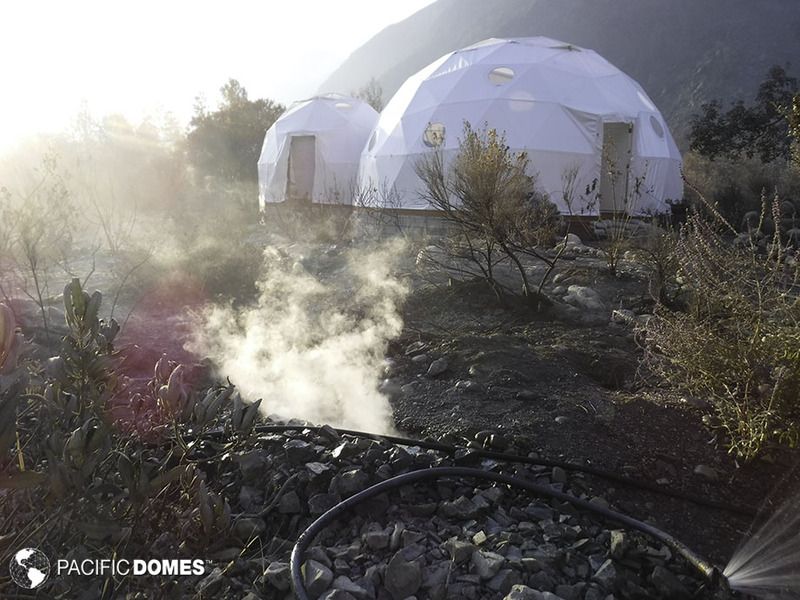 A 16′ and 24′ dome are connected to create a place for guests to meditate and find shelter. 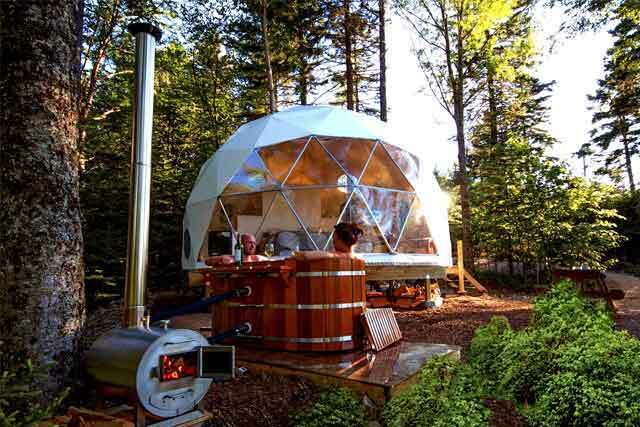 In the garden, two connected geodesic domes offer guests a meditation space and shelter from extreme elements. 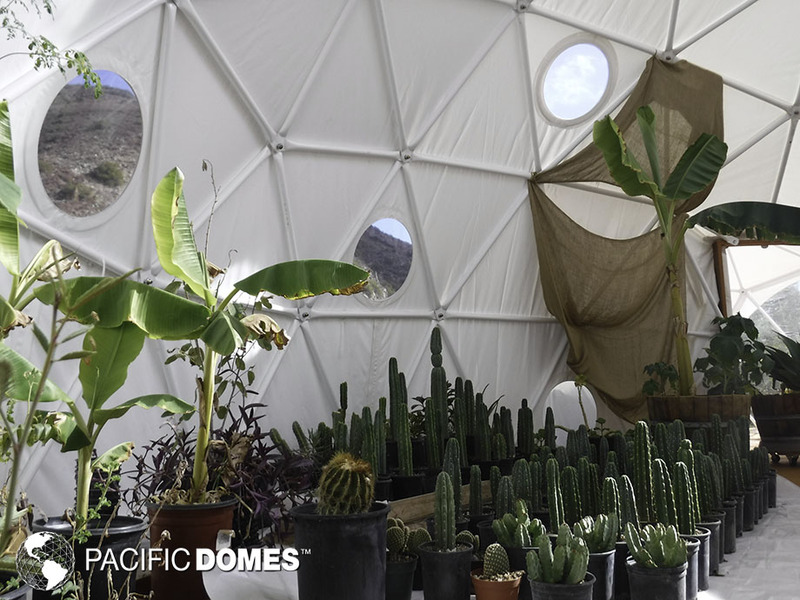 Jayson Kaufman, Ojai’s Ecotopia Land Steward, says his favorite thing about the domes is “the soft dome shape lighting up the valley at night.” The domes have also served as greenhouses to grow various plants, such as banana trees and cacti. Nearby hot springs boast a main pool, and several smaller pools with Matilija Creek provide a cold water plunge. In conjunction with the garden tour, guests at Ecotopia often enjoy the use of the pools. The dome is being used as a temporary home for the plants before they transition into the elements. On December 7th, 2017, a wildfire blazed through the valley where Ecotopia is located, burning about 80% of the land. 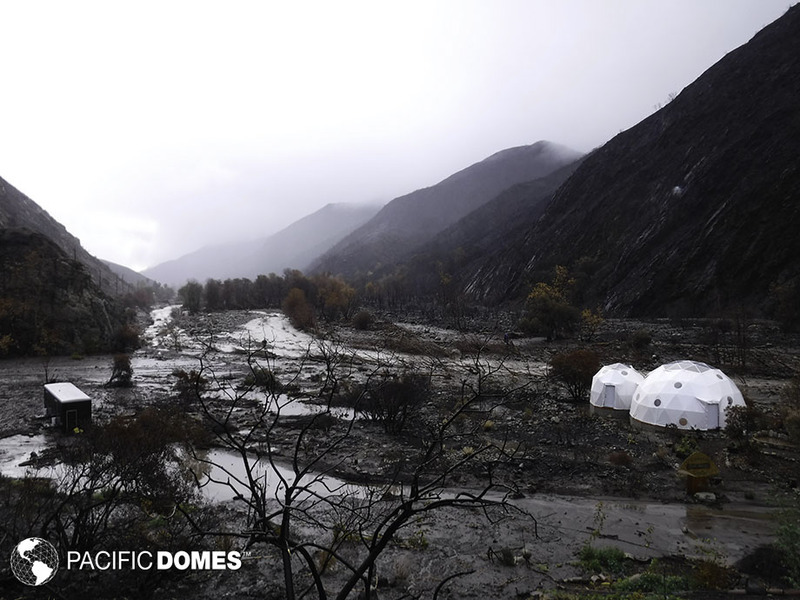 Through-out the area, structures and plants burned, including trees growing right next to the domes. The domes survived, with the only damage being two burn holes the size of pennies in the cover, where burning embers managed to land on, but not ignite, the fabric. In fact, the only structures left standing were the domes, almost certainly due to the seamless fire-resistant cover, as well as the inherent aerodynamic qualities of the dome form. 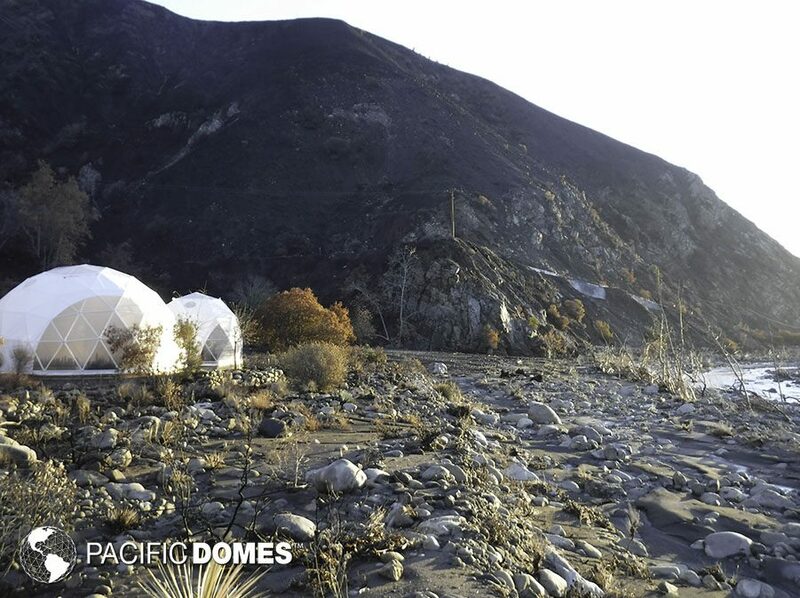 The domes survived the fire due to their flame resistant fabric and geodesic shape. On December 7, 2017 a wild fire blazed through the land, scorching everything in sight. 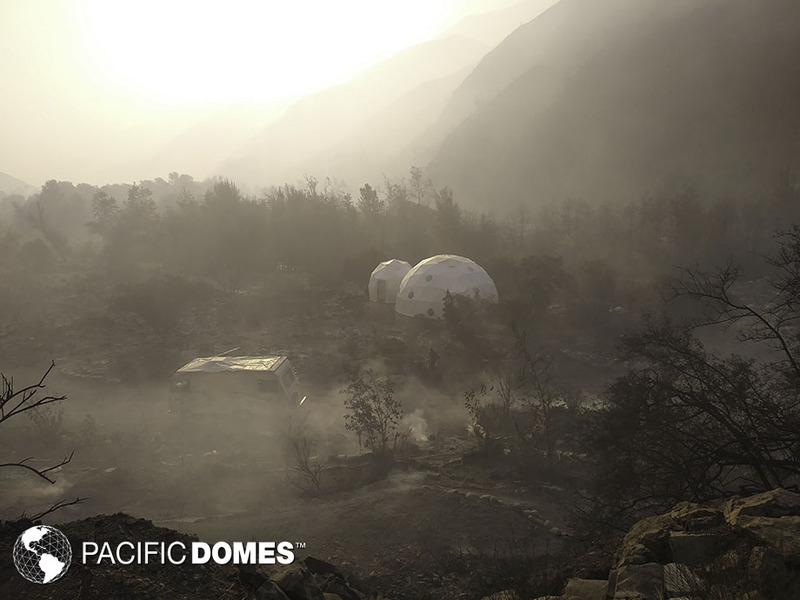 The domes were left unscathed amidst the ashes and smoke. A month after the fire, Matilija Creek flash flooded during a storm. Again, the domes were unscathed. Securely built on the solid brick foundation, the domes remained safely in place as the area around them washed away. Geodesic domes are designed with different sized triangles repeated in a complex geometric pattern. The shape of a triangle makes it very strong and able to withstand heavy loads. Indeed triangles are the strongest of all shapes known to man, making domes the strongest, most light-weight structure. 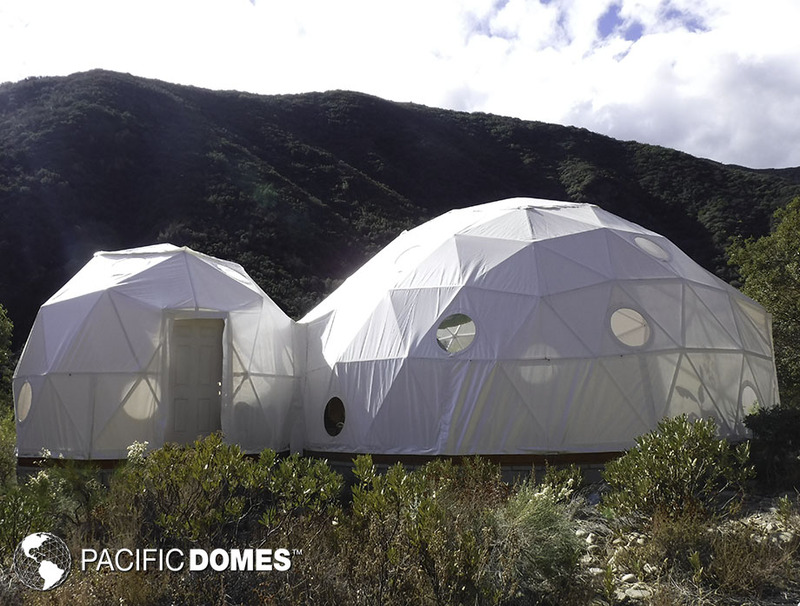 The cover of the domes is made with Pacific Domes’ Sunshield Fabric which is extremely durable and perfect for long-term outdoor use. Sunshield is vinyl coated Polyester, 19 oz. /sq. yard, flame, water, mildew and UV resistant. Call Pacific Domes today at 541-488-7737.